It was a beautiful St. Petersburg day in November, with a breeze in the air to keep us cool and the presence of love and friendship all around us. Margot and Mark were one of those couples that remind me of how joyful an experience that weddings truly are. 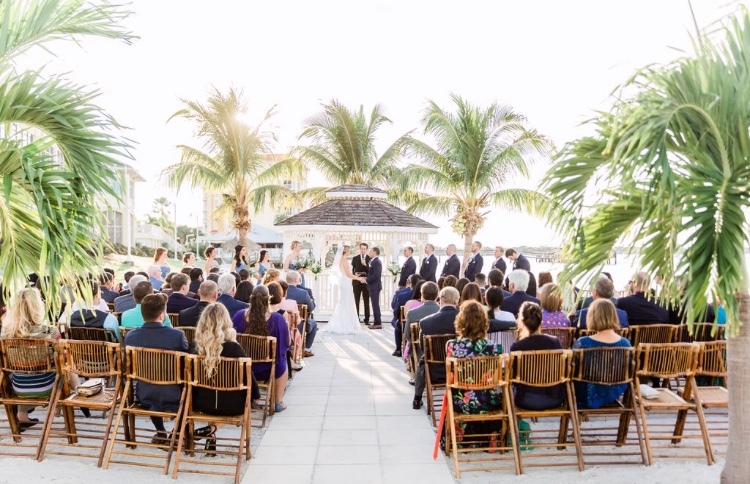 The team at Isla Del Sol Led by Melissa Rowjohn provides a memorable experience and outstanding service for the couple, their guests and vendors. The ceremony was held by the water near an intimate gazebo perfect for such a special occasion. Jeff Kathrein Of K&K Photography captured some amazing moments of the whole evening and even provided the finished photography ahead of schedule. I laughed several times at how fun and lively Mark and Margot’s friends and family were throughout the ceremony, truly rejoicing for them and providing overwhelming support. I enjoyed my time meeting the couple over Starbucks coffee before the ceremony and will never forget being a part of their special wedding day! Pastor Brian Jones of the West Coast Team of Sensational Ceremonies officiated this beautiful wedding.